Hurtful relationships can cause you to close your heart. How can you trust again? Taking you beyond the pain of the past, Dr. John Townsend offers practical tools to help you re-establish closeness with those who wronged you, recognize true change, move past relational pain, and create a safe environment for trust to thrive. Unabridged MP3-CD; approximately 6 hours 19 minutes; 1 MP3-CD; performed by Dr. John Townsend. You can open your heart again. 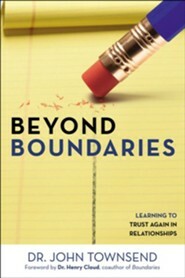 The bestselling book Boundaries gave biblical guidelines for establishing healthy relationships. Now, Beyond Boundaries shows you how to move past relational pain to experience the freedom and love God designed for your most intimate relationships. 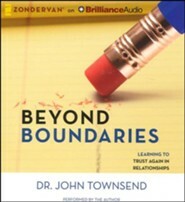 In this audiobook, author and relationship expert Dr. John Townsend will help you answer these vital questions: Why are boundaries so important for intimacy? How do I know the other person is ready for reestablishing a relationship? How do I know I’m ready? With years of experience helping clients build and repair relationships, Dr. Townsend has discovered key principles that will help you move from caution to true connection. You’ll discover how to: • reinstate closeness appropriately with someone who broke your trust • discern when true change has occurred • reestablish appropriate connections in strained relationships • create a safe environment that helps you trust • restore former relationships to a healthy dynamic • engage and be vulnerable in a new relationship as well How do you know you’re ready to trust again, and what does it take to be ready? Beyond Boundaries will help you find the answers that move you toward the closeness and intimacy you’ve been longing for. Dr. John Townsend is a psychologist, popular speaker, cohost of the nationally broadcast New Life Live! radio program, and a cofounder of Cloud-Townsend Clinic and Cloud-Townsend Resources. 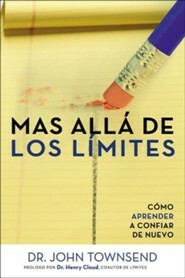 He is coauthor of the bestselling Boundaries and author of Boundaries with Teens and Hiding from Love. 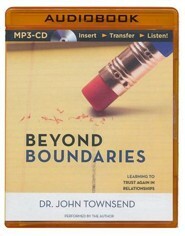 I'm the author/artist and I want to review Beyond Boundaries: Learning to Trust Again in Relationships - unabridged audiobook on MP3-CD.